This is a complete how-to guide, from first boot to first file copy, on how to build your very own Gluster file storage cluster on 45drives (or any storage device capable of running Linux). It is meant to serve not only as a straight copy/pasteable recipe for creating the initial cluster and for adding nodes, but to also give insight into the how’s and whys of system settings and planning. If you don’t care to read the hows and whys, or if you already have a good understanding of Gluster and Linux you can scroll down to the “Full Command List” section. * To have a fully redundant windows compatible file server cluster that is hardware agnostic, able to scale to any size, expand compute along with storage space, survive a full node as well as individual drive failure, and best of all be completely open source! With hardware agnostic open source linux software packages, in theory you could run this on any two+ devices that can boot 64bit linux, however I’ve found the following to hit a pretty good price point and the rest of this guide is focused around the 45drives Storinator. Redundant power supplies, higher end raid cards, and no screw drivers required for installing/removing drives were a few reasons I ended up with them over other similar options. Whatever you go with… remember, the more nodes you have in your cluster the faster and more tolerant of failure it’ll be. Another important note is you’ll want storage with a decent cpu and good amount of ram. ZFS will be doing on the fly dedupe of files and file compression among other backend tasks and you really don’t want a cpu bottleneck while trying to write large or multiple files. The more ram the more cache you’ll be providing ZFS for fast file access, so be sure to toss in a good amount for a cheap speed upgrade! Browsing the Gluster readme docs for explanations on different types of configuration and redundancy settings can quickly make your head spin. I’ll try and quickly explain what I believe is the best option for both node failure protection and storage capacity. 1. Simplicity, you only have to worry about one zpool and one brick for each node. Sure if you only have two or three nodes its pretty easy to keep track of 2, 4, or 6 zpools/bricks in a node but once you expand to 10+ nodes keeping it all straight becomes a far bigger headache for not as much gain. 2. Easier expandability as more nodes are added. With multiple bricks per node, you could in theory expand one node at a time. While this looks great on paper, expanding each node introduces a much larger amount of risk as you have to ‘break’ one of the existing brick pairs before expanding into the new node. This was a risk that I wasn’t willing to take with production data, especially with the low cost of the 45drives hardware and ability to just buy two nodes at a time instead. 1. You must expand in pairs of nodes. You can’t expand one single node at a time as you might be able to with other brick configurations. 2. The rebuild size of the zpool/brick is larger, and if you have a very large node with over 60 drives it can take quite some time to complete if a drive fails, thus increasing the risk of another drive failing during rebuild. With one brick per node, your first two nodes are paired, aka the data is mirrored between them, allowing one node to become offline while the data remains available. The third node in this case does nothing. You can either use it to create a third copy of the data (for extra protection) or just something else entirely (maybe backups). In this configuration, each node has two bricks (think raid arrays). This allows the ‘mirrored’ or paired data between nodes, but also a ‘staggered’ approach to the mirroring, allowing a third node to be added without breaking the ‘one pair per brick’ rule. One important thing you want to avoid!!! is pairing two bricks that reside on the same node. By pairing them on the same node, if that node experiences a failure you’ll lose both pairs, and the entire volume will fail. Expanding with one brick per node is a straightforward process, simply add the new two node pair to the overall gluster volume and your capacity increases on the fly. No data must be rebuilt, and everything continues as it was, just with more space. Expanding with two bricks per node in a staggered configuration is a bit more complex and requires removing a brick pair and then establishing two new pairs in its place. While technically possible to do, there is some risk of data loss/long rebuild times while the pairs are adjusted and rebuilt. Either way, for this guide, we’ll assume you are also doing a one brick per node configuration… onward to networking! You’ll want two networks minimum. Ideally you’ll also want 4 nics. Also note I labeled the links to each network as “bonded”. In this case bonded simply means able to fail over to (either via active/active or active/standby). In my case I used vmware’s built in network failover capabilities but similar are available in centos itself. Regardless of the technology you decide to use, you still want to try to provide two paths to each network. You’ll also want your cluster traffic on a different vlan than your normal filesharing traffic. Cluster traffic can be quite chatty, and also take up _a lot_ of resources so keeping it isolated on the network is hugely important. 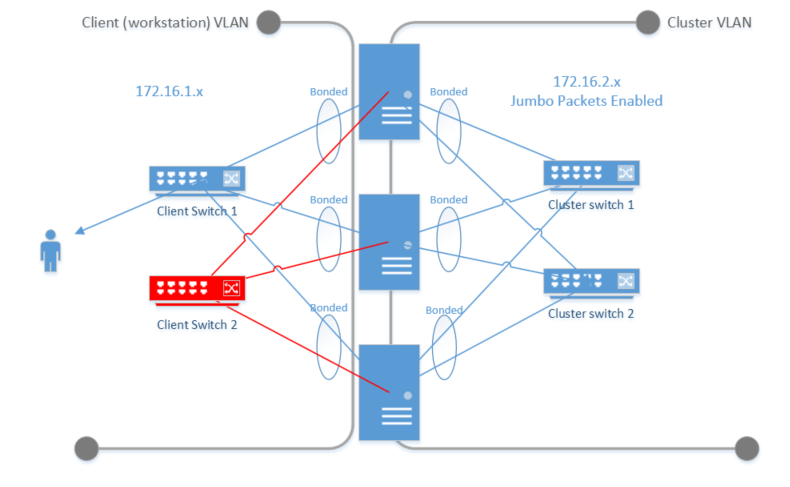 Having two runs to each network allows a single switch to fail, and still have a means to communicate, either to the other gluster nodes (cluster network) or out to clients. Even if it isn’t directly hardware related, you’ll have to eventually perform maintenance on networking equipment… best to allow for failover now than scheduling maintenance windows hastily later. 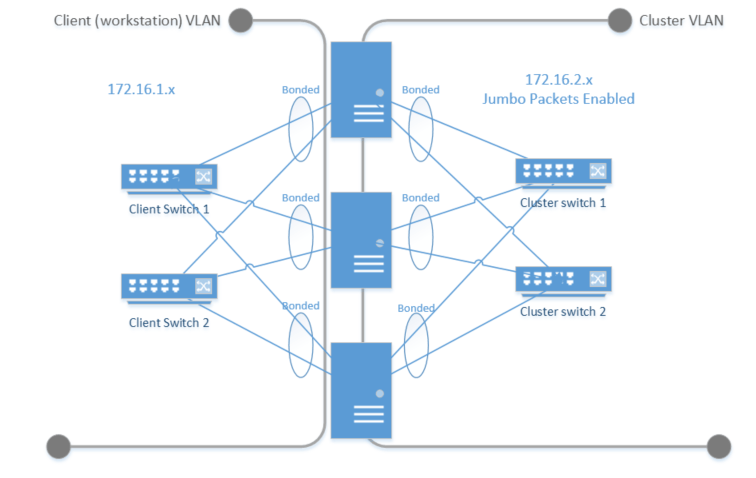 Network specific commands, and switch specific configurations, are currently outside the scope of this guide. If there is enough interest at some point in the future though, I may create a secondary guide purely based around gluster networking. Ok enough theory and planning, let’s put these 45drives boxes to work and get us a cluster! 9. Create the zfs zpool (raid6 array) from the raw drives and call it ‘brick1’. If you want to add a spare drive, place ‘spare sdx’ at the tail end of this command, where sdx is the spare drive to use. 31. Reboot for the selinux changes to take effect. At this point, if all you want is NFS, congratulations! Your done! You can now connect to the gluster cluster via the public facing ip address you added to CTDB. I highly recommend creating a dns A record to this ip for ease of use. Remember if you ever plan on doing node maintenance to stop the ctdb service on that node before begining the maintenace process! ← Panasonic BB-HCM581 cameras won’t respond? Here’s why. How’s your small file performance with this setup? We built an almost identical setup, but made a few different design decisions (e.g. HW RAID 6 with three arrays per server and XFS instead of ZFS ). Curious if yours is any better with the large bricks and ZFS instead of XFS. I found that larger bricks improved performance enough that it was worth it over smaller bricks, but not enough to make it a ‘must do’. What’s your cpu usage on the backend storage like when you’re doing small file benchmarking? I’ve followed this guide and others but after successfully setting up gluster I’m getting stuck setting up CTDB. How does the public_addresses file IP address, subnet, and interface translate into a physical connection? That is, if I enter 192.168.1.3/24 eth1 in the public_addresses file does this create an interface on Linux that then requests the 192.168.1.3 address from my DHCP server? I can’t set a static IP without a MAC address. Or am I supposed to setup some type of virtual IP on my router (pfSense)? Thanks for any advice you can provide, I can’t find the answer anywhere online. public_addresses are the VIPs (virtual IP addresses) you want the cluster to have. CTDB will then begin responding to ARP requests for that IP address, providing the switch/router with a valid mac address. This means that if another server tries to ping that 192.168.1.3 255.255.255.0 ip address, whichever clustered server that currently ‘holds’ that virtual ip will respond back and also provide its current real mac address. It’s all done outside of an additional load balancer (pfsense, F5, whatever), so think of it more like built in failover protection of sorts provided by CTDB itself. Of course that means it’s not providing actual load balancing (aka each request goes to a different VIP/ip), so your welcome to toss all of the VIPs behind pfsense to get true load balancing across nodes. Also if a node goes down, that VIP will change to a new host. For example if you have three nodes, and three VIPs, you should get one VIP per node. This is helpful for load balancing because you can put all three VIPs behind your pfsense load balancer, and it will properly round robin requests. If one of the hosts were to then go down, you would have one of the remaining hosts answering for two VIPs, ensuring connections to the now dead host still get answered/responded to. Of course you’re welcome to not use the VIPs at all, and instead put the real host IPs into pfsense, but you may have issues with active sessions dying if a host goes down. As far as DHCP, you’ll want to exclude any public_addresses IP’s from the DHCP scope, so that the VIP is not given out to another computer on the network by mistake in some way. Hopefully this helps clear things up a bit, if not let me know! How would you configure GlusterFS to migrate Windows server VMs that have 2 x 2TB local LVs on the KVM Servers? We are migrating from DAS on our KVM servers to GlusterFS to host our VM Images / LVMs maps. I have a problem figuring out how to convert/migrate large LVs into the Gluster cluster. Do you mean GlusterFS is having a hard time handling 2TB+ individual files? You want to be careful with extremely large single flat files since if gluster gets out of sync it will have to re-copy the entire file due to split brain issues. If you are running a larger node count its _usually_ not an issue but its still a risk and not ideal in terms of how gluster was designed to be used. The very best solution would be to stand up new windows fileservers in kvm (or p2v only the OS drive/partition), then have those servers point via iscsi to gluster for storage on a separate windows drive letter. Once you have windows backed by iscsi instead of large kvm disks, you can do a lot more with windows built in failover features, MPIO, and you also have a MUCH better overall footprint for glusterfs to handle file replication/sync across nodes since it would only be syncing individual windows files. I kinda sorted this out using sharding! I thing that sync would be much faster with shards, i’m used to use rsync with the benefit of splt files! So i created large (2TB) sparse file (qemu-img -o preallocation=metadata) on the Gluster volume. What do you think about this? Now the second part of my reflexion is regarding JBOD vs RAID on the servers. Gluster supports Erasure Coding but i don’t really know how it would tax the servers (storage and KVM server). If i relate to Linux software RAID, it seems to be not too heavy on resources. On the other hand, i know that the Mellanox Gen6 (*i think*) Infiniband/Ether cards support EC acceleration: the problem is to confirm if Driver/API is supported on my CentOS 7 test bench! Hello and thank you so much for all the effort you put into the documentation. I’ve been working on a solution for some time, but unfortunately I’ve always had the problem with the permissions on the lockfile. According to your documentation it finally worked. Contrary to many others, you don’t have a ‘ cluster’ entry in your SMB configuration, which surprised me honestly. And you have created an extra volume for the lockfile. I think that was the solution for me.